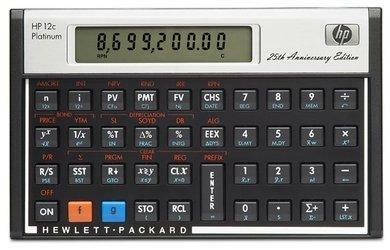 The HP 12c Platinum is brand new generation of Hewlett-Packard Financial Calculator with a new and faster processor. It will allow the User to work in both RPN Entry and Algebraic Entry Mode. The HP12C Platinum runs up to 6 times Faster than the original HP 12c. The memory has the capacity for up to 400 steps. It can now handle up to 80 cash flows (20 cash flows on hp 12c). Comes with 130+ financial, business and statistics functions. Weighing only 70 grams. Note: This calculator has been approved by CFA Institute for Chartered Financial Analyst (CFA) examinations. And also the GARP FRM and CFP Exams. HP Part Number F2231A. Tagged By: HP 12c - 25th Anniversary (1981 - 2006), CFP - Certified Financial Planner, Battery - Replacement Chart. I bought the 1977 model made in Brazil and used it until late 1998 when it died. It only used three or four batteries in its entire life of being pounded on 5 hours a day for 20 years. How did you buy one in 1977 when the 12C didn&apos;t come out until 1981? They didn&apos;t start making 12C&apos;s in Brazil until the late 1980&apos;s.